Tina arrived at Belfast Zoo on 14 June 1966 from Tyseley Pet Store in Birmingham and was Belfast Zoo’s longest resident but sadly passed away on 5 November 2017 after collapsing. The cost of shipping an elephant was £20 in 1966 and at that time, it was necessary to provide three bales of hay, half a sack of oats, half sack of bran and eight large loaves for the journey. When Tina first arrived in Belfast she measured one metre in height and weighed about 150 kilograms. During those first few months, a keeper slept with her to keep her company and feed her during the night. For the first few years Tina had a daily walk with her keepers until she became too large. Tina, the Grand Old Lady of Belfast Zoo, became well-known for her mischievous behaviour in the zoo. She was notorious for stealing and eating visitors’ items, including handbags, coats, gloves, school bags and cameras. She also destroyed lawnmowers and had a penchant for picking locks in the old zoo. Tina also displayed a sensitive side and often rescued small birds and frogs that got into her enclosure. When the new zoo was developed the largest and most expensive house was the elephant and giraffe house. It officially opened on 27 May 1988 and this became Tina’s new home. The decision was made for Belfast Zoo to become a retirement home for these iconic animals.. In February she was joined by Yhetto from Krefeld Zoo, Germany and in April she was joined by ex-circus elephants Jenny and Dhunja from Hannover Zoo. Sadly Jenny passed away in 2013, aged 53. Tina was pampered at our zoo. In 2010, a mud bath made with 40 tonnes of clay has been added to the elephants’ enclosure, as one of many ways to pamper the four ladies. Tina also received regular pedicures and had her skin is moisturised often. On Sunday 5 November 2017, Tina collapsed in the early hours of the morning. The zoo team and veterinary staff, along with assistance from Northern Ireland Fire and Rescue Service, worked tirelessly with Tina throughout the morning. However, the extremely difficult decision was made to put Tina to sleep. 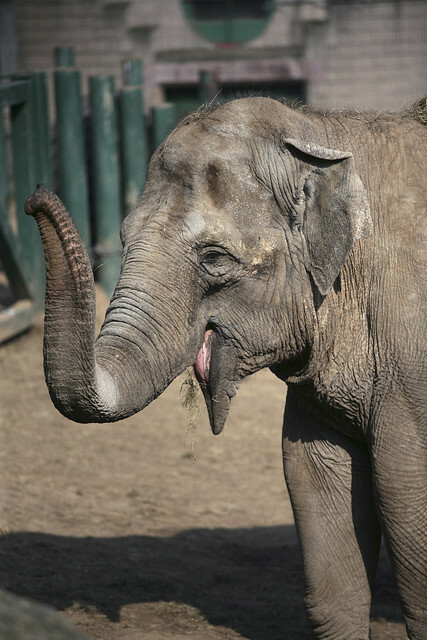 Tina was one of the oldest elephants in the European breeding programme. I have worked at Belfast Zoo since 1988. I first started as a keeper in the old zoo site where I first met our lovely lady. She was such a mischievous character and I, like all of the other staff and visitors, formed a quick attachment to Tina. In 1998 I became the curator of the elephant section and in the subsequent years, with working so closely with her, my bond with Tina strengthened even further. Over the past 30 years and throughout my career in the zoo, I have seen many changes but there was always one constant and that was Tina the elephant. Her life spanned nearly six decades and this is a great tribute to all of the excellent care she received from keeping staff over those many years. She was part of the development of the new zoo site, she was part of our breeding herd when we bred Vishesh, in recent years we celebrated her 50th birthday and she was also the founding member of her sanctuary for elderly female elephants. I consider myself very lucky to have known Tina and formed such a strong relationship with her. She has been an important part of my life and I feel like I have grown up alongside Tina. It is genuinely like losing a member of the family but I am incredibly grateful for the memories and the times that we shared together. I would like to take this opportunity to thank everyone who showed us support during this difficult time. We have been overwhelmed with the kind messages that we have received and are delighted to know that Tina touched your hearts as much as she did ours. Tina will be greatly missed but we have been incredibly lucky to share her journey. Over the past six decades, Tina became an important character in the heritage of both Belfast Zoo and the city as a whole. When I was little, around 7 years old, at Christmas you could wrap a present for the elephants then go down into the walkway and feed them. I had the upmost honour and delight to feed Tina an orange she took it out of my hand. I’ll always remember it. I’m now 20 and studying animal behaviour and welfare. When we took our daughter to the zoo for the first time, she was very excited to see an elephant. When we went into the elephant house there was Tina, but our daughter ran out crying. In her ABC book there were pictures of an elephant, a dog, etc that were all the same size so she wasn’t expecting Tina to be so big! After her initial shock, she came back in and Tina became a family favourite! Always remember my childhood trips to Belfast Zoo and Tina was all of our favourite. Years later, now living across the water, I made it a point to take my girls ‘home’ and each time to go to the zoo and see all the animals, but most importantly, Tina. We all shed a tear yesterday. Beautiful creature. Tina was a name mentioned all the time in our house for about three years. During a visit to the zoo about nine years ago with my two boys, my youngest picked a lavender smelling elephant teddy in the gift shop which my eldest named Tina. His Tina then became his comfort, he rubbed her label and took her everywhere, wouldn’t sleep without her. She had been stitched together more times than I could count over the years. He took such wonder and interest in elephants and every visit to the zoo he still gets excited to see Tina. Tina the teddy and Tina the elephant will always have a special place in our hearts and will never be forgotten. I remember when we were able to feed Tina buns! I’m also in my 50s so I have seen Tina many times over the years and my children and grandchildren also visited her and her family. She was definitely my favourite. Tina has always been a favourite with our family and we try to arrive in time to help feed the elephants. The kids getting to geed Tina a carrot was always the highlight of our many many visits to see her. When I was young I had fruit for Tina. I put it in my handbag which my granny had given me so I reached out to get her a bit of fruit. The next thing she has hooked up the bag. The keeper for it back but not before she took the rest of the fruit. She will be sorely missed. I remember her eating a wee girl’s straw basket with an Easter egg in it. She was never just an elephant but just Tina, on our visits as children and as parents, we went to visit Tina who just happened to be a magnificent elephant – stealing our crisps and coats. Will miss her! RIP Tina. Four generations of my family visited her. I have many fond memories of visiting Tina at the zoo over the last 50 years. Like a lot of people in Northern Ireland I went to the zoo with my parents in the early 80’s and remember feeding Tina apples we had brought. The end of an era for all the keepers at the zoo. It’s hard to believe that she went to the zoo three years before I was born. 1982 and we were recording a TV programme at the zoo. It was a three-day shoot and at the end of the first day the riggers laid out the cables near Tina’s enclosure ready for the next morning. The following day we arrived to find Tina had carefully balanced on all four legs precariously on the edge of her moat to drag the cables into her enclosure and had chewed them into amass of shredded spaghetti (I kept a piece as a souvenir). Some of the large brass connectors were also missing but I am told they ‘turned up later’. Bye bye Tina, you gave us a good laugh. We would like to thank everyone for their support following the death of Tina the elephant. We appreciate all of the kind messages which we have received. Belfast Zoo’s mission is to be a major force in conserving and safeguarding habitats and wildlife to make a significant contribution to their survival in the future. The zoo creates conservation links between captive populations of endangered species being managed ex situ (outside of its natural habitat) and wild populations being managed in-situ by supporting a number of conservation projects. Belfast Zoo supports the Asian Nature Conservation Foundation (ANCF), a non-profit charitable trust. If you would like to make a donation to the campaign to support the conservation of Asian elephants, in Tina’s memory, visit http://www.asiannature.org, or you can donate in person at the Zoo, by phone or by posting a cheque payable to Belfast City Council.